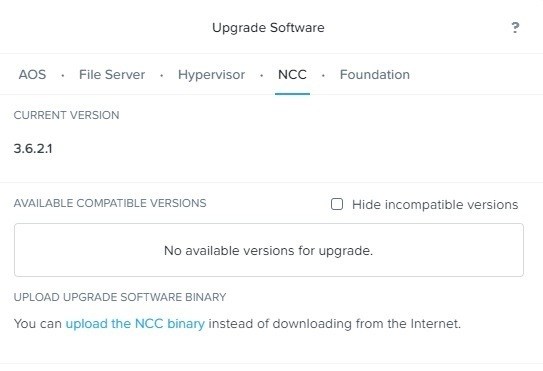 When I attempt to upgrade ncc from 3.6.2.1 I get no available upgrade path in the Element. The question is why is the element not able to automatically see any new version to download and install? Will I have to manually download NCC to install? Are there any issues in upgrading from 3.6.2.1 to 3.6.4? "All actions require an API Key"
You need to make sure your Cluster VIP, and CVMs are not being blocked trying to reach out to Nutanix. Below is a link showing a list of all required Firewall prerequisites needed to connect your cluster(s) to Nutanix.